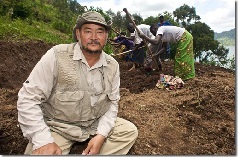 Green Gold takes you to China, Jordan, Ethiopia, Rwanda and Bolivia. It is the story of healing landscapes – at scale – and with it restoring life, livelihoods, resilience, peace and a future worth living. The Dutch broadcaster VPRO collaborated with the EEMP on a documentary film which received almost 400,000 hits on You Tube (via the Permaculturenews.org website), (www.permaculturenews.org/permaculture-tv.htm).